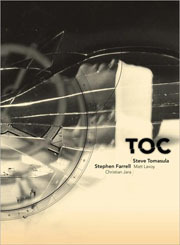 Last year, FC2 published Steve Tomasula’s “new-media novel” TOC, an assemblage of text, film, music, photography, the spoken word, animation, and painting that comes on a DVD for “reading” on a computer. A multimedia epic about time—the invention of the second, the beating of a heart, the story of humans connecting through the lens of history—TOC is an evocative, steampunk fairytale. It also represents a new literary genre: a marriage of conventional narrative and image use with the possibilities for fiction that are opened up by the computer. Now in its second “printing,” TOC was awarded The Mary Shelly Award for Excellence in Fiction, and a design award from the Association of American University Presses. For excerpts and a closer look, see www.tocthenovel.com. 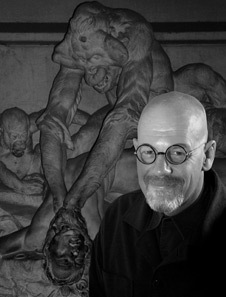 Steve Tomasula’s short fiction has appeared widely in magazines such as Bomb, The Iowa Review, andMcSweeney’s. His previous novels are VAS: An Opera in Flatland; IN & OZ; and The Book of Portraiture. Steve Tomasula: At first I thought of it as sort of a ”chamber opera” — a story told to an audience of one, on a tiny stage, as if a 12-inch monitor were puppet theater—and told, through its staging, music, and sets, the way operas, or graphic novels, or other word-image hybrids are staged—except I didn’t want any of it acted out, or even illustrated, as in these other forms. Rather, I wanted the images and the rest to work as text, the way I used them in my earlier print novels; I wanted to use all these languages we use to make stories—text, images, graphs, data, ads—as other ways to speak. For me it always starts with asking, what are the things a book can do? In this case, the book could include music, and animation, and the programming that makes it richer in texture and layers, hopefully, than it would be with words alone. YT: Since the reader/viewer drives the process of reading TOC, the work bears some resemblance to computer games. Did you consciously pattern TOC on computer games, hoping to engage the user in the same way? ST: Yes and no. The interactive nature of TOC came more out of “C-U See-Me,” a short story I originally wrote for print, but then adapted to the web. The story is about surveillance, so I wanted to give the reader a sense of being watched as he or she reads, and to let the reader watch or spy on others. I tried to weave the unease of watching and being watched into the story in a way that wasn’t possible in print: for example, at one point, the story asks the reader to supply his or her name, then the software of the story checks the reader’s computer to see if it was registered in that same name—that is, the story spies on the reader to see if they are stealing software or lying about their name. At another point, the story has the reader do the spying by letting them watch people at work through web cams. Something like that was the experience that I was going for in TOC, and while to me it is still a book, and its “user” is still a reader, I guess these terms would have to be thought of more broadly: it is a “book” in that the reader experiences it one-on-one, and reads it as they would any novel, but it uses graphics, video, and music to help set the mood and to help tell the story. YT: There is a well-known novel that encouraged the reader to select his own path before the availability of personal computers—Julio Cortazar’s Hopscotch (Rayuela). Were you influenced by this book or other predecessors in any way? ST: Yes, very much so—I don’t know if I was consciously trying to model TOC on those earlier novels, but they make up the backdrop in which we understand formally adventuresome literature. I’m thinking here of Hopscotch, but also of Raymond Federman’s Double or Nothing, Walter Abish’s Alphabetical Africa; George Perec’s Life A User’s Manual, Gilbert Sorrentino’s Mulligan Stew, and other image-text novels like William Gass’s philosophical Willie Masters’ Lonesome Wife, Lee Siegel’s great (and fun! )Love in a Dead Language, the first wave of hypertext novels, of course, and many, many others. . . .
YT: Much of TOC is narration accompanying still photography and animation; in this, it feels very much like a film. Were you influenced by film? Writing TOC, did you think of yourself as writing a movie script? ST: No—maybe more like a graphic novel, or poetry that uses space as part of its poetics, as Apollinaire does. As with my earlier image-text novels, I did consciously write using images as part of the narrative, so it’s not like the novel is written and the images added in afterwards. I’ve always used imagery as another form of “text” that can add layers to the story. Once upon a time, all books were like this: children’s books, of course, but also Victorian novels and illuminated manuscripts. That is, thinking of a novel as a construction that can be made of lots of things, not just text, is liberating, and this is even more true when sound and motion can be included. So from the start, I’m thinking of how images, music, sound effects, can be part of the narration. I guess the influence of film did come in as I began to imagine what would happen on screen as the story was read or told. And decisions about what to present as text and what to present as a voiceover to be listened to began to push it toward a hybrid of film and book. Maybe that’s the best way to think of it: as this hybrid, in that the writing was very much like writing a novel, but with stages that novels don’t usually go through. For example, I had to storyboard out what was going to happen, and when or how, and tie it all to the programming—when to scroll, when to click, etc. YT: A number of other people contributed to TOC. Stephen Farrell provided images and design, and you use video and other art, animation, and lots of music, including some by Eric Satie. How did you manage to meld all of this into a cohesive work? Was there much of going back and forth between you and the collaborators? ST: Yes, there was a lot of back and forth with the artists who contributed work to TOC, most of whom never actually met each other. I think I and Chris Jara, the programmer, were the only ones who saw the entire novel before it was published. A lot of time was spent recruiting people to be voice actors, or musicians, or one of the other kinds of artists needed to pull this off, with some collaborators joining the band, so to speak, and eventually dropping out, and then others coming on board as the needs of the project dictated. The core of the novel is a 30-minute animation that was originally published as a text-only story. At the time I was working with Stephen Farrell, the graphic designer, on a literary magazine, and thought it would be kind of cool as a word-image story, so we put in a lot of time together developing it that way. Some of the photography I shot—the astrolabe that is sort of an icon or visual motif that runs through the novel—came from the storeroom at the Planetarium in Chicago; I shot the photos of the Mayan calendar in the National Museum of Mexican Art. He used found footage and created artwork, and we worked together to come up with ideas for the layout and graphic design, which he created. Since the story is about time, it seemed to be a natural step to incorporate time into the story, to animate it—and of course animation asks for music, and music for composers and musicians. You can see how the project began to grow. It was a lot like putting a band together, or maybe an indie film. With the writing finished, my role as author shifted from one of writer to conductor, or producer, or director, or grant writer—and sometimes mediator, music and art director, and programming director. Over fifteen people, spread out across three countries, contributed work to this, so I spent a lot of time coordinating their work. For example, Tim Guthrie did the final animation, which is kind of a solar system fly out: I would give him a match frame, a frame of video (which was made by Chris Jara from my storyboard sketch) that Tim was supposed to match the first frame of his animation to, and describe what I’d like him to do; he’d go off and work, then come back with what he’d done, and then we’d discuss what was working or not working with the overall conception for the novel, or with parts of the story that other artists were working on. When his piece of the puzzle was done, I’d give it to the programmer to fit into the overall structure he was creating. So TOC came together mostly through years’ worth of exchanges like that; most of the time it was working in this fashion, though in a few cases—Zoe Beloff and Chris Speed, for example—I’d seen work they’d already made. The whole book in this way is a gigantic mosaic, with the individual pieces made by lots of hands. YT: When you started to work on the text, did you know that it was going to be “illustrated” so to speak? Did you already have a visual conception of the final work? ST: For the core story, no. I wrote it like any other text-only story for print publication, though it did have a collage structure, so its form lent itself to thinking of it in frames or panels. After I worked with Stephen to turn it into a word-image story, though, I started writing the other pieces of the novel with visuals in mind. At the time a general rule of thumb for writing for computer screens was to limit text to the words that could fit on an index card, because that was about all the text on screen that most readers could handle comfortably. So I tried to write short sections, though not necessarily sticking to cards. As with VAS and The Book of Portraiture, my other word-image novels, I tried to use visuals as part of the story, especially in terms of what parts of the narrative I was going to tell through words, and what parts of the narrative would be carried by images. I did have a conception of what this would all look like visually—you had to in order to storyboard it out—but sometimes this consisted of just brief descriptions; for example, I described a clock-tower that would incorporate lots of devices people have used to measure time—water clocks, sundials, etc. —then Maria Tomasula made the oil painting of it that Chris Jara animated. So it went through transformations each time another artist was involved, and at each stage these collaborators brought their own ideas to it, made refinements, suggestions, gave it form. YT: Speaking of time, “toc” of course asks for “tic” to precede it. Why are you interested in time? Novels are typically written about people, or at least about living things. What made you write a book about time, and how does time reveal itself in human beings? ST: I don’t really write autobiographically, but at the time I began working on the story that would become the longest animation in the piece, both of my parents were dying. There was something eerie about that synchronicity—like a whole way of life being swept away the way a village at the bottom of a dam might be if the dam bursts—and that was sort of the genesis of the piece. While my father was ill, we’d talk a lot about his life, and about “his time,” as he put the era he lived through—the Depression and WWII—and you could see how “his time” shaped who he was, how he lived. He could see “his time” passing into “my time” —the time of those who didn’t live through all of that, who thought in terms of different histories or contexts—the progression gradually making him and his way of thinking an anachronism, as time will make all of us anachronistic. So I guess that ultimately I do think of the novel as being about people, though the approach is to get at things by making visible something that is as invisible to us as the air. YT: Let’s go back to the formal aspects of TOC. It seems to me that TOC is not nearly as “individualizable” as a typical computer game. The user has two basic choices—the Chronos path or the Logos path. The Chronos path offers a film that one can skip around in but probably won’t, because it feels like a film. In the Logos path there are more possibilities—you can go clockwise, which reveals that “Tic” means “the people” and “Toc” “the non-people,” or counterclockwise, which gives you the opposite definition of the words. You can also go nonsequentially through the various stages, but since there is no logical interdependence between them this will not produce significantly different readings. Are there more fundamental consequences? ST: The short answer is that TOC is a novel and not a game, so though it might have some elements in common with a game, it has a lot more affinity with a novel: the main navigation screen, for example, the screen where you can select a path, is essentially an animated table of contents, eliciting different paths through the book, but also recording which parts have been already visited. The main differences are in the reading experience itself and in what story is ultimately told: it is possible for readers to take a direct line through the novel and reach its end without seeing some of the sections that would change their understanding of the story. On the other hand, a reader could take a more meandering path through the novel, and at the end have had a very different experience. As in theater or other time-arts media, the experience of the novel is very much part of the novel. YT: You provide an on-line user’s manual which may or may not be referred to. How do you expect readings to differ between the naïve and the initiated user? ST: How readers would read was the big mystery when bringing the book to production—how would people actually use it, how much direction they would need, and how much could they be left to their own devices. To try to answer these sorts of questions, I mainly followed my own experiences with hypertext and print books, trying to avoid the things I’d always hated about hypertext—e.g., not knowing when I was done, not being able to tell how much of the book was left, not having a sense of the whole. Getting caught in loops where links keep sending a reader back to a section they’d already read was another frustration I wanted to avoid; in TOC, it’s pretty clear what you’ve read. You can revisit it, as in a print book, but it’s just as easy to skip ahead and keep moving. This seemed especially important in a novel about time, since the ability to tell where you’re at in a book shapes how you understand the section you’re in (just as an awareness of where you are in time shapes how you understand the past). But I felt like I also needed to build in some “directions for reading,” cues that would tell the reader when to just sit back and enjoy the parts that the computer performs on its own, or when they need to use the mouse, or do some work to move the narrative forward. (In VAS I’d tried to build in similar “directions”: one section has bold headings along the tops of collage pages that tell the reader it is okay to keep turning pages, or to go down into the collages as one would read footnotes.) But really, my hope is that these sorts of directions would be subliminal, the way furniture in a room can direct traffic without calling attention to the fact. I’d prefer people to just start reading TOC, without consulting anything. YT: Have you had any interesting feedback from readers you could share with us? ST: In addition to what I mentioned above, I will say that along with genre expectation, there seems to be a generational divide—or maybe it was a media-orientation divide, which just happens to break down along generational lines. But the older, book generation were most likely to sit on their hands, only using the mouse to “turn the page” and read fairly linearly. Those born post-PC would use the mouse to race through the entire work, to get the lay of the land, to see what was there and what did what; then they would come back and read, dipping in here and there according to those sections that had piqued their interests most. They also thought they “caused” things to happen in the novel much more than print-oriented readers, who thought that the ones who “caused” things to happen in the novel were the characters, and they, the readers, were just spectators. I think this illustrates something about the nature of reading and readers and the nature of the book, especially as books move into an electronic format, but I’m not sure what. YT: Tell us a little about the history of TOC. How does it relate to your earlier work? What stages did it go through? How long did it take for you to write it? ST: A poet once told me that novelists are lucky because they only have to come up with one idea every five or six years. I always thought that I must be even luckier than that as it seems like I’ve only had to come up with one idea at all, as all my novels seem to deal with different aspects of representation: how we depict ourselves and each other, who has the right or power to depict others, and how this plays out both across time and within the different means we have to do so, be they scientific, literary, visual, or whatever . . . So TOC is an extension of this. It’s also an extension of how I’ve always incorporated the materials of the book into the story. In VAS—a novel about the bio-tech revolution we are living through—I made a conscious effort to use the body of the book as a metaphor for the human body and vice versa; if you look at the edge of The Book of Portraiture, the pages appear as strata in an archaeological dig, which evokes, I hope, the central idea of that novel: the archaeology of human representation through layers of history that make up its chapters. “C-U See-Me” was another early work that incorporated things like interactivity and tracking and links—things you can’t do in print—into the telling of the story itself. There’s that concern with materials in TOC, too, except the materials in this case include the clock of the computer, the 1s & 0s of machine language, as well as the text of human language: it’s a time-arts piece in that it is both read and plays out in real time, and given that it’s about time, these materials are central to the telling of the story, and the experience of reading it. They might be used to elicit a meditative mood, for example, or, at other times, a more accelerated experience of time, such as a person might have while playing a game. The main story of TOC was originally published as a text-only story in Literal Latte in 1996; a year or so later I worked with Stephen Farrell to make a word-image version, which came out in Émigré. Spreads from Émigré were hung as a Moebius strip from the ceiling in an exhibit at The Center for Book and Paper Arts (in Chicago), where Maria and I also did a reading of the story with images projected on a screen behind us, and this was sort of the genesis of TOC as a multimedia piece—theater, in a way, was always part of it. I began thinking of it not just as a stand-alone story, but as a piece in a multi-media whole: I began to write brief chapters around it, basically using that story as the “present” and extending the story back towards mythic time, and forward toward a future. I began to write other sections, thinking about how they all relate as part of a matrix of stories about customs, and history, but a history in which characters don’t know all the parts because some parts haven’t happened yet, while others are so old they’ve been forgotten. Mapping it out was pretty much just taping paper sheets together and creating a flow chart for how things would link together, sketching out a storyboard for how they would fit together, as well as create a flowchart for the commands that a reader would activate to move through the story. YT: Do you envision the “new media novel” becoming a new genre, with many writers/artists working in it? Do you think it will eventually replace the paper novel? ST: Nothing will ever replace the paper novel, any more than film replaced theater, or photography painting. They do remediate each other, though, to use Bolter and Grusin’s insightful concept, or as Sukenick put it, they make each be more essentially itself: once photography was invented it allowed painting to be more painterly, less about documentation (depicting kings and queens, for example) and more about painting itself. I imagine something like this will happen to paper books once electronic books are ubiquitous: there will have to be a justification for printed paper—they will become more about their materials, the experience of reading, or maybe back to something like artist books, or one of a kind books made by a scribe, or some other form that gives an answer to, Why not just read on a Kindle? TOC is a different genre, somewhere between reading and film—a Frankenstein of a book I would love to see more of—a genre of literature in the way theater is a genre of literature. I love theater but I also love to read printed novels; they’re different experiences, but lucky us, we don’t have to choose only one or the other, and I imagine that’s what will become of books like TOC: there will still be lots of authors working as authors long have, in print, just as there are those who write for the stage or screen, but there will also be some who create multimedia novels, and these novels will be very cool given the increasing ease with which something like this can be done. As the materials themselves become more fluid, authors will be able to focus on the story or poem itself rather than on the technical challenges. And of course, if there’s money in it, the way there is with video games, you’ll see big commercial interests moving in to make hybrid best sellers by Tom Clancy, etc., the way they already turn those kinds of novels into games. Hopefully the money won’t squeeze out books as art, or the indies, as it has tended to in film. YT: What are your plans for the future? Will you continue working in this genre or will you go back to something more traditional? ST: Right now I’m working on a collection of word-image short fiction, and a novel, Ascension, which traces our relationship to nature through our depictions of it—from naturalist sketchbook to folders of genetic information. Both will be image-text print books; all the maps, gene sequences, networking maps, and other visuals associated with subjects like this are just too rich not to draw on, and given the historical sweep of the story, it seems like paper has to be involved—at least for the first chapters. Maybe the last chapter, which is set today, should be an app.